The Moutin Family Reunion group, recorded at the University of Louisiana at Lafayette. Students understanding of jazz led them to focusing on solos, and one took the initiative to climb the catwalk over the lights to get an overhead shot. We got on board with Snarky Puppy before they started to get famous. Recorded in Lafayette, Louisiana by the live sound class in 2012. Unfortunately no one was in position to see the horn players in the tiny, crowded club. Lafayette is in the heart of Cajun and zydeco country. This recording of BeauSoleil was made with one camera following the series of verses and solos down the street at KRVS radio. Mixed by Robert Willey. Thanks to BeauSoleil, Karl Fontenot, and Mark Dewitt. For a phenomenon like Sonny Landreth all you need to do is leave the camera set up on him the whole time. Video and audio recorded by Jiro Hatano at Grant Street. Audio mix by Robert Willey. A documentary approach works well at a cultural festival like Festivals Acadiens. This recording of the Frank Family Band is included on a DVD we made with KRVS called From La La to Zydeco: Creole and Zydeco Music From Louisiana, published by the Center for Louisiana Studies. The video starts with Preston Frank playing the accordion, switches to his son singing and granddaughter dancing to the double violin lead, and the audience dancing in the park. Frank Family performing at Festivals Acadiens, recorded by students in the UL Lafayette Music Media Program. Mixed by Ivan Klisanin. A recording of Marc Broussard downtown at Festival International. Chad Fouquier's production is in a rock concert style with lots of quick changes of angles and locations that adds to the energy. The University of Louisiana at Lafayette Jazz Ensemble recorded with three cameras. One stayed mostly on a wide shot and could be cut back to during the editing when neither of the other two cameras had usable material. Sometimes they were both unsteady as they zooming or panning at the same time. A studio recording by the UL Lafayette Jazz Combo III. At 3:53 we opened the back wall to a window on Rio de Janeiro, where João Donato lives, to whom the song is dedicated. Performed by Jazz Combo 3: Ab Coulon, piano; Ashley Lewis, flute; Brian Robinson, drums; Jack Langlinais, surdo; Cordario Webb, trumpet; Cory Murray, flugelhorn; C. J. Sellers, bass; Spencer Chipman, tenor saxophone; Ted Tiedeman, bariton saxophone; Trevor Granger, tamborim; Ty Katserelis, guitar; Robert Willey, keyboard. The Lovell Sisters recorded at the University of Louisiana at Lafayette. Students were less familiar with bluegrass arrangements and instruments, and it took them longer to zoom in on soloists. ​Students had even less experience with Gamelan and Taiko drumming. For the video for these performances they went with whatever caught their eyes. Directed by Joe Payne. Recording of the University of Louisiana at Lafayette's Faculty Jazz Ensemble. Better quality cameras and communication between director and camera operators resulted in a higher quality recording. Composed by Garth Alper. Performed by ULL Faculty Jazz Group: Bob Luckey, sax; Paul Morton, trumpet; Garth Alper, piano; Jeff George, guitar; Robert Nash, bass; Troy Breaux, drums. Jordan Hollier, Chase LaBure, Cameron Smith, recording; Jordan Hollier, Tyler Sonnier, Zayd Mseis, Justin Doan, cameras; Kris Wotipka, direction - Thanks to Acadiana Open Channel for video production Chase LaBure, audio mixing; Robert Willey, audio supervisor, producer. A Little Shorter from SOM Professor on Vimeo. Students marked up scores indicating when camera angles should change. A wide shot recording of "Sing to the Lord, " the sixth movement of Requiem of Psalms composed by Paul Baker, one of the members of Chorale Acadiens, whoperformed the work at the University of Louisiana at Lafayette. This is what you typically get in a large ensemble concert if you don't have a plan. ​Video Example 17: Sixth movement showing master shot from single camera in the back of the hall. 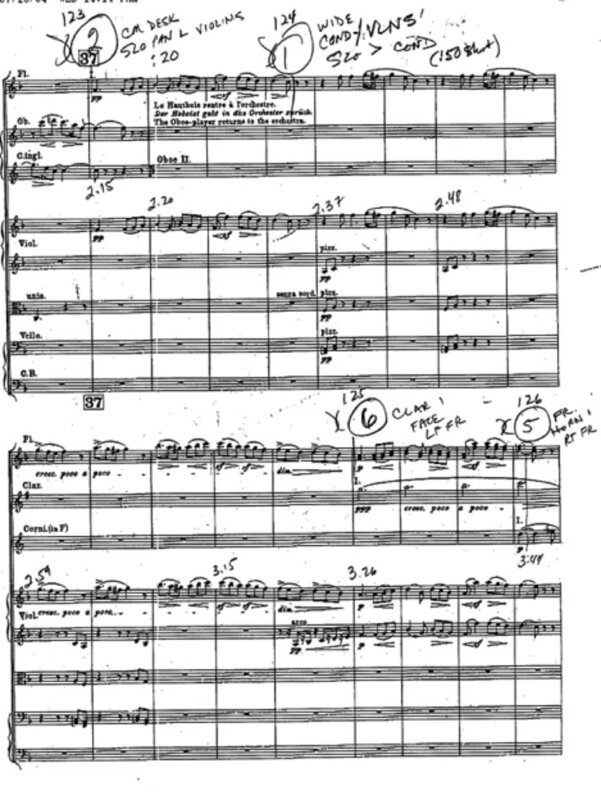 The sixth movement begins with an introduction featuring the baritone soloist, followed by an A section in C major leading off with a dotted rhythm motive, with the text based on Psalm 96.The camera switches to the brass as they double the vocal lines. The strings transition to the B section in G major, where the woodwinds are accompanied by the harp. The text comes from Psalm 84. The camera looks for the women’s entrance and then widens out to show the whole choir. A slow pan follows the pp vocal marking. The angle switches to the other side as the choir swells. We pan across the ensemble through the strings and timpani preparing for the return to the A section. There is a modulation to D major with a canon in unison between the men and women. For the coda we switch to the conductor, adding emphasis to the dramatic conclusion.